In the two decades since the government started requiring nutrition labels on food packages in 1993, nothing much has changed. Well, obesity rates have gone up. And people have become more interested in what they’re eating. And we’ve added separate labeling for common allergens and debated whether to note genetically modified ingredients. But those black-and-white labels have remained the same, and now the U.S. Food and Drug Administration thinks it’s time for a change. A new proposed label design was announced this week, and the government is seeking public feedback. Left: the current label. 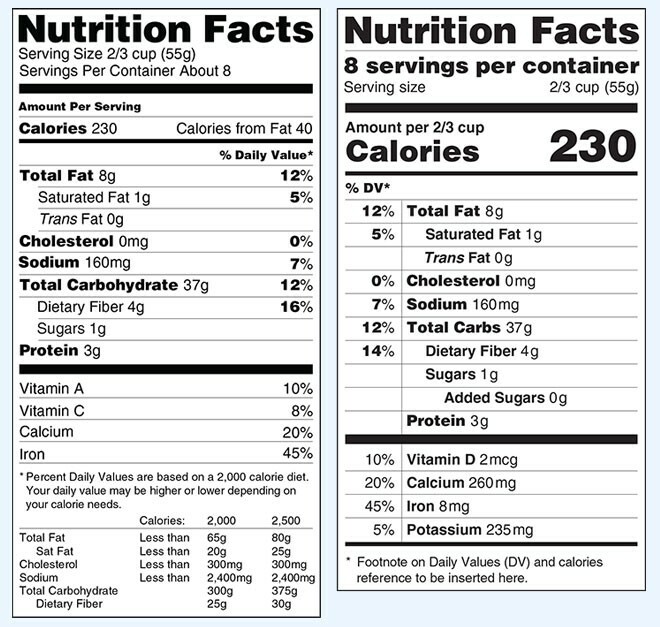 Right: the new proposed label with calories listed more prominently and other changes. • The number of calories is now in strikingly larger text than anything else on the label. “The number of calories is especially important to maintaining a healthy weight,” says FDA science and policy adviser Jessica Leighton in the media release. • The calories from fat are no longer listed. The amount of total, saturated and trans fats will still be listed — but there are enough health differences between “good” fats and “bad” fats that the FDA no longer thinks it’s valuable to list all fat together. • The number of servings per package is more prominent, and more precise. Instead of listing the serving size separately, and then telling you calories per serving, it reminds you right there how much a serving is supposed to be. The FDA also proposes updating serving sizes to reflect how much people actually eat for one serving, instead of the ideal. Because who eats four tortilla chips? Another suggestion is providing both information per serving and information per package for some foods that people are likely to consume all at once. Because who really gets 2.5 servings out of a bottle of soda? • Labels now include “Added sugars.” Many foods naturally contain sugar — but it’s the added sugars that contribute most to empty calories that make us fat. The average American consumes way too many calories from added sugars, and now that will be more obvious. • Potassium and Vitamin D will now be required with the other nutrients. Those are two nutrients that help prevent chronic diseases, and the FDA’s research indicates people don’t consume enough of them. • The Percent Daily Value numbers are shifted to the left. Overall, the changes are not radical — and that’s good, because consumers have gotten used to reading the nutrition facts the way they are. The original designer is still pleased with it, and other prominent designers praise its stark simplicity. But what if you busted the whole format? 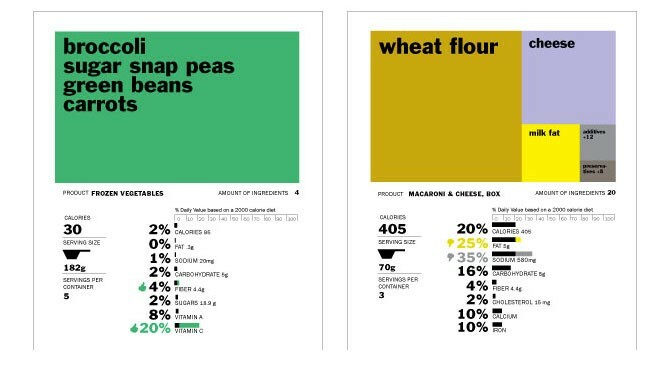 Is there a way to present nutrition data in a more visually striking way? A contest held several years ago at the University of California, Berkeley asked designers to entirely reimagine the label, and the entries showed how color and symbols could be used to make the basic information more understandable at a glance. 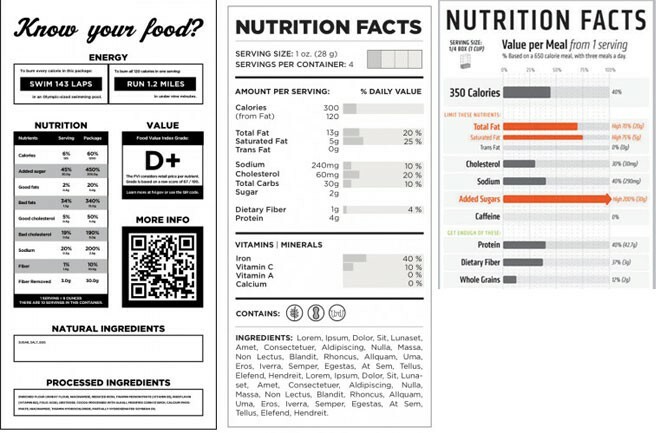 A lot of them are pretty-looking nonsense, or include aspects of food processing that don’t fall under the FDA’s purview, but this is a classic information design problem and it's worth thinking about how to present nutrition information in a way that's quickly understandable. Unsurprisingly, the best ones kept the simplicity.